In a recent review of experimental and computational analysis of tRNA dynamics, we showed that molecular dynamics and network analysis can capture the observed conformational changes in tRNA as it carries out its fundamental roles in protein synthesis . In the first step of translation, an amino acid is added onto the end of the transfer RNA (tRNA) bearing the cognate anticodon according to the genetic code. 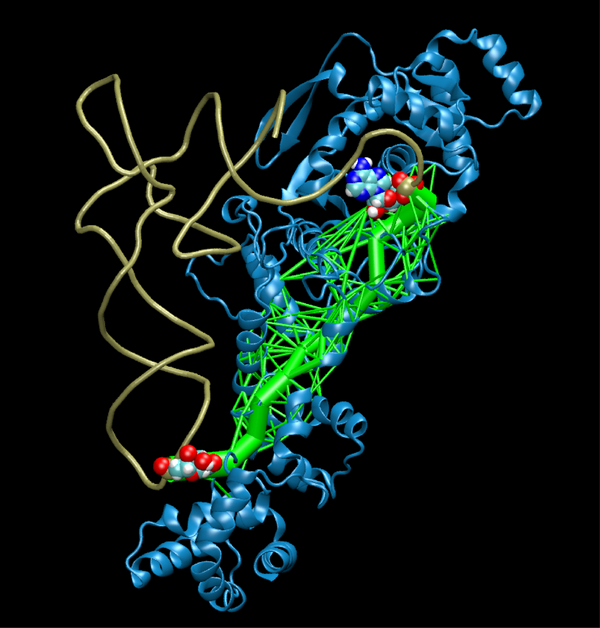 The proteins that catalyze the charging of tRNA and set the genetic code are the aminoacyl-tRNA synthetases. From a pool of thousands of amino acids and tRNAs in the cell, each of the 20 distinct synthetases must recognize and pair the correct amino acid and tRNA. How the signal is transmitted from the anticodon on the tRNA to the distant site of the chemical reaction in the protein:tRNA complex has puzzled scientists for a long time. After charging, the tRNA leaves the synthetase and binds to elongation factor Tu (EF-Tu) for transport to the ribosome. This entire process occurs on timescales much longer than those available to current molecular dynamics simulation. Now, using network analysis algorithms in combination with molecular dynamics simulations, researchers in Zan Luthey-Schulten's lab in the Department of Chemistry have been able to identify the network of interactions used for signaling in the tRNA:synthetase complex and track the initial changes as tRNA migrates from the synthetase to EF-Tu [2,3]. The network algorithms, developed originally by computer scientists to study the communication patterns in the World Wide Web, air travel, and the spread of disease, were adapted to find the optimal and suboptimal communication pathways. To create a network model, each amino acid and nucleotide in the protein:RNA complex is represented as a node with edges connecting pairs of nodes that are within a set contact distance from each other. Variations in the connectivity of the network arise from local correlations derived from molecular dynamics simulations. These variations appear as modules which can be viewed as local communities in the network. Nodes within the same community are highly interconnected and can communicate through a large number of paths with a small difference in “distance”. The thickest path in the figure corresponds to the optimal signaling pathway from the anticodon binding site to the active site where the amino acid is attached to the tRNA. R.W. Alexander, J. Eargle, and Z. Luthey-Schulten. Experimental and computational analysis of tRNA dynamics. FEBS Letters, 584(2):376-86, 2010. A.B. Pyrkosz, J. Eargle, A. Sethi, and Z. Luthey-Schulten. Exit strategies for charged tRNA from GluRS.Journal Molecular Biology (in press). A. Sethi, J. Eargle, A. Black, and Z. Luthey-Schulten. Dynamical Networks in tRNA:protein complexes. Proc Natl Acad Sci U S A, 106(16):6620-6625, 2009.